A three-chamber folding door system with thermal insulation that enables arrangement of wide open passageways. The visual thickness of profiles in use has been reduced to give the design a light look. 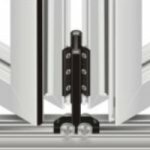 A new design of integrated hardware: one hinge with the bottom truck, one hinge with the grip and handles at a low height. The new hardware improve the functionality of design.